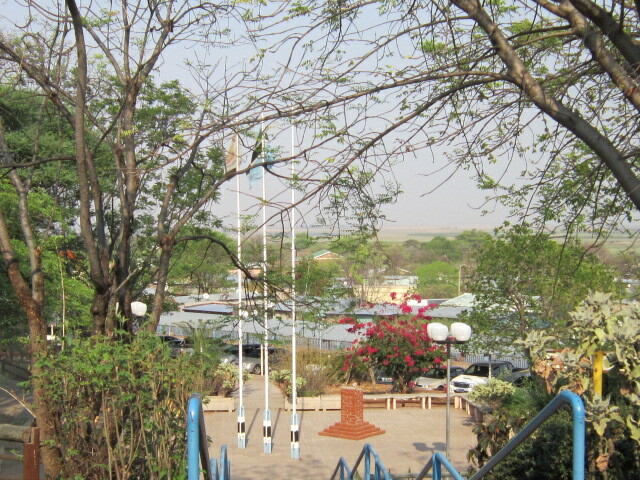 Here is the view out over the Town of Kasane from the steps of a District Council Meeting room – before the Warthogs came to visit. now I also want to tell you that the locals will explain to you that the litter in their yard is because the elephants were in their garbage – that beats the raccoons! Not sure I would want to walk outside my house and find an elephant going through my trash can. Will post more later, need to go back out now! At least an elephant cannot get on your roof. I would hope!!!! Janet, they rip entire trees out of the ground so stomping on a house would not be out of their limits. They are gentle giants unless they feel threatened and than they become very aggressive to protect their young and other members of their family. Thankfully, I am now back in Gabs and only have to worry about baboons coming for tea.